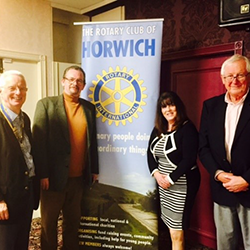 Rotary Club of Horwich - Welcome! We raise in excess of £20,000 of charitable funds each year and distribute them to worthy local and International causes. We also meet each week for a meal and some social interaction. 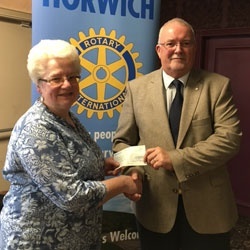 Another fantastic cause - Rotary Club of Horwich are proud to support Rev Caroline Tracy and Members of the Horwich Churches Namibia Committee to assist them purchase Solar Lights for rural Townships in Namibia. On February 12th 2019 Bolton Rotary clubs sponsored the third annual Tournament, which was organised by members from Bolton Daybreak, Bolton with Le Moors and Westhoughton Rotary clubs. Also supporting were Bolton Lever, Horwich, and Turton Rotary clubs. 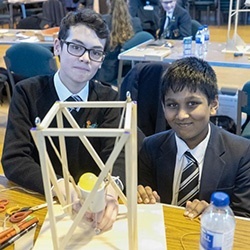 Taking place in Canon Slade school, four Bolton Schools supported it bringing over 50 year 9 students working in teams of four. Rotarian Geoffrey Pearson and Judith Pearson helped with the collection for Action for Children at the University of Bolton Stadium this weekend. An amazing £363.75 was raised to help local children in the Bolton and Horwich area. 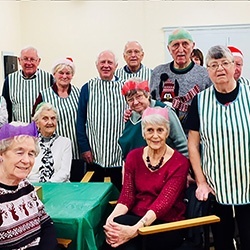 Members of the Horwich Rotary Community Committee got together to cook and serve the Luncheon Club members a full Christmas turkey meal at the Horwich Resource Centre. The Luncheon Club members meet every Tuesday and Friday throughout the year for a meal of soup, filled roll, pudding and a hot drink at a cost of just £2 per head. The Community Committee decided to treat them to turkey and all the trimmings, plus Christmas pudding and a rich white sauce. 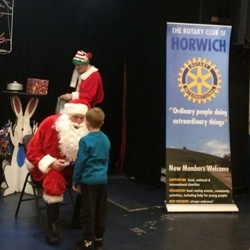 The Horwich Rotary Club annual Kids Christmas Party was held again at Horwich Rmi on Sunday 9th Dec.
Children aged 6-9 were invited from the 9 Primary Schools situated in BL6 – Horwich and Blackrod. More than 80 lucky youngsters were thoroughly entertained by Smiley the Clown with activities, fun games and music. A fantastic time was had by all at the Horwich Community Choir Concert held on Monday evening at the Parish Church. 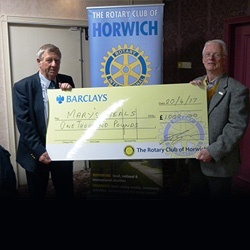 The Rotary Club of Horwich were invited as we donated to the Choir during the year. The Mayor of Horwich was also in attendance. 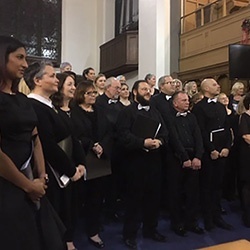 The Choir and Specialist Guest Soloists, led by Rachel Hughes, sang some wonderful songs. 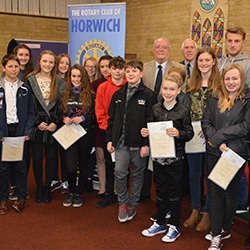 The Youth Achievement Award Scheme run by the Rotary Club of Horwich is designed to foster the development of individual talent for young people, under the age of 19, who live or attend school in Horwich or Blackrod. The scheme is not means tested and is concerned solely with identifying and developing individual talent in all forms of activity, regardless of family circumstances. This year the scheme attracted a large number of quality applicants, who live, or go the school in, the Postal District of BL6. Many thanks to John Mountrie who delivered an insightful talk on Remap an organisation of engineers who custom-make equipment to help disabled people live more independent lives. At our 22 March meeting we heard a lovely young lady give a inspired talk about her life with MS and how she formed new friendships and a new hobby which gave her so much more. A sense of freedom. Bolton Sailability is a charity based on Belmont reservoir offering the disabled a chance to learn how to sail. She's taken to it so well that she is fund-raising for new equipment that will help her and other disabled people a better and safer experience out on the water. Santa Is Coming To Horwich! At 6.00 on 1st December Santa & Horwich Rotary’s Christmas sleigh will be at the Crown for the switching on of the town’s Christmas tree by the Town Mayor, Councillor Steve Rock this year accompanied by Horwich RMI Brass Band and Fr. Richard Howard from St Mary’s. 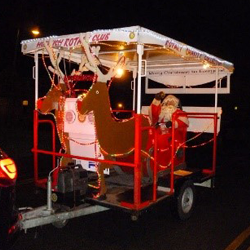 So Santa and the Rotary sleigh will begin Horwich Rotary’s Christmas collection for local community groups as well as international support for the Rotary Foundation’s ‘Ending Polio Now’ campaign. Look out for Santa who is coming soon. Vic and Denise Silcock were welcomed as members of our Club at the start of October. Denise and Vic have been established for many years in Horwich as the proprietors of that excellent local newspaper ‘Living in BL’. They were proposed by Pat Byrne who has known their support and professionalism in so many ways. They will make an excellent contribution to the life of our Club. 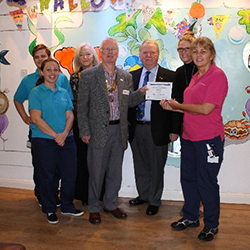 President David, Vice President Margot and Secretary Phil were much moved when they recently visited Derian House children’s Hospice at Chorley to present a cheque for £1,130. The cheque was presented to Derian House staff members Caroline, Claire, Daryl and Kirsty who provide respite care for families with very sick children. 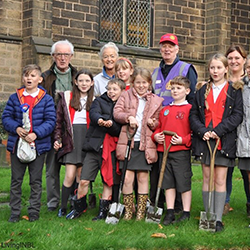 At the beginning of November President David Griffiths, & Vice-President Margot Mather and friends met with children from Horwich Parish School Eco Council and member of staff Mrs. L Magilton. They met to explain what Rotary International is doing, with the support of the Gates Foundation, to end Polio forever in places like Pakistan. 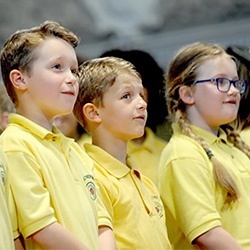 Children from across Horwich took part in the week long Bolton School’s Music Festival in June. Choirs from St Catherine’s School and Claypool sang on the first night. Chorley New Road Primary School choir sang on the Wednesday, whilst Horwich Parish School choir, sang on the Thursday evening. 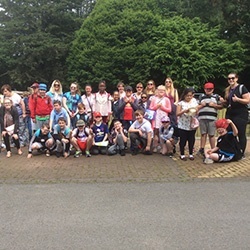 Every year, Kids Out, called the 'Fun and Happiness Charity' team up with Rotary International (RIBI) to take over 25,000 children from up and down the UK on a fun day out. 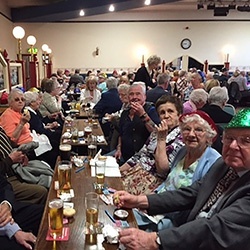 The 10th holding of this very popular event was yet again a great success and enjoyed by over 150 of our local senior citizens. Bussed and taxied in from all over Horwich and Blackrod, our guests enjoyed excellent entertainment from Singer/DJ and comedian Tom Scott ably assisted by his wife. Audience participation was his speciality and several guests were persuaded to take part. A pasties and cake supper followed by a Free raffle plus Bingo with cash prizes were enjoyed by all. 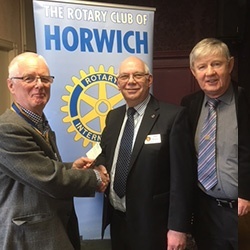 Horwich Rotary Club were delighted to sponsor the event again this year, donating £600 towards the prizes and supplying several Stewards on the day, which was a great success. With a record entry of 371 runners and a big supporting crowd the race was held in ideally cool weather conditions. Winner for the second year was Horwich Harrier Chris Farrell ( nephew of John Farrell, a Friend of Rotary ) in a very creditable time of 17 mins 27 secs. 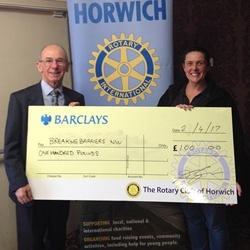 Horwich Rotary embarked on a new idea to raise funds for our Charity Account. 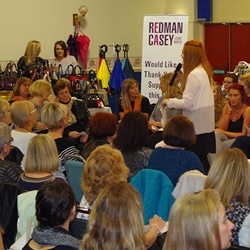 On 23rd March we organised a ladies fashion show, with an entrance ticket cost of £5 per person. 200+ tickets were sold and the main hall at the RMI club was packed to capacity. The show was run by a firm called Colours who took control of the fashion side of the evening after bringing their own clothes and models. Thanks to Duncan Hamlett of Lunesdale Rotary Club, who gave a great talk at our showcase evening on Mary's Meals. Mary's Meals is another fantastic International charity that Rotary Club of Horwich supports. 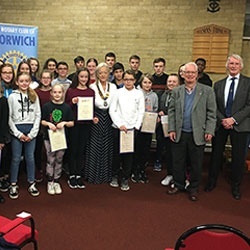 Through our International Committee, Horwich Rotary Club works in partnership with the Rotary Club of Port Alfred in South Africa provides an eye clinic in an area surrounding Grahamstown. The eye clinic project is ongoing and is overseen by Rotarian Bev Radue on our behalf. 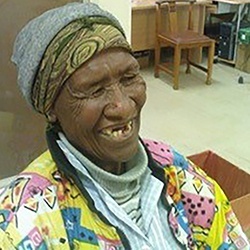 Clinics are held twice a month at a town called Nkwenkwesi and treats local vulnerable people who would otherwise be completely blind within a short period of time. Breaking Barriers is a twofold organisation founded by 3 parents of disabled children with various requirements. 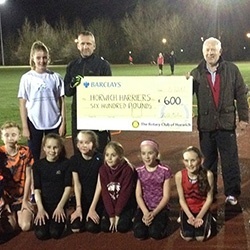 Just one of the great projects that Horwich Rotary's International Committee supports. For the past few years, Sparrow Park, in the centre of Horwich, has been looked after by the Rotary Club of Horwich. 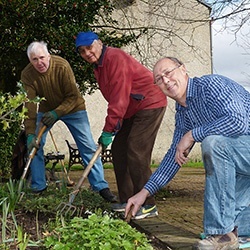 After many years of neglect, the park needed a complete makeover, and a number of Rotarians cleared the ground, put many bedding plants and bulbs in the gardens, cleared and weeded the turfed area and re-laid part of the pathways. In addition they repainted the seating, railings and lights. Meriel from Bolton Young Parents Service came to speak to Rotary Club of Horwich before Christmas, about the support that the Organisation is able to bring to young parents. Young mothers who have babies, or pregnant Mums, sometimes find themselves in difficulty arising from a range of issues e.g. no parental support, problems with young fathers, and financial problems. 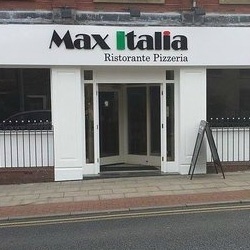 Horwich Rotary invite you to a fantastic Italian Evening at Max Italia, Horwich. Open to all, including non-rotarians. Join us for a fantastic Italian Evening at Horwich's own Max Italia restaurant. Wednesday 18th January, 2017 - 7 for 7.30pm. Any starter, pizza/pasta or chicken dish plus dessert and coffee for only Â£15pp - Message us to book your place today! 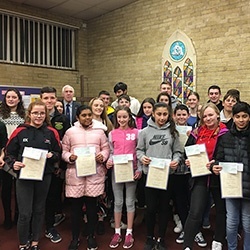 Students at Rivington and Blackrod High School and Sixth Form hosted a Community Christmas Party on Wednesday 21st December 2016 for members of the local community. Celebrating the festive season with homemade Christmas food, the party included performances by the Music and Performing Arts Departments, and a personal appearance by Santa Claus. 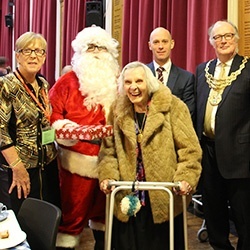 Residents of local care homes and members of the senior citizen’s community groups were invited to attend. 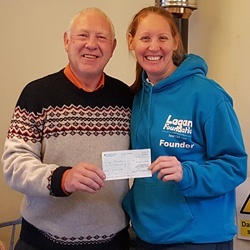 Community Chairman, Keith Maher, was able to hand over a Cheque for Â£400 to the Lagans Foundation Founder Carren Bell. The foundation provides Volunteer help to mothers who have given birth to babies with Congenital Heart defects.These babies are very difficult to bring up and need 24 hour care. Most of these babies have multiple defects and many cannot feed normally and need stomach tubes to survive. Young mothers find the situation so difficult that they cannot cope, especially if they have other young children to bring up. 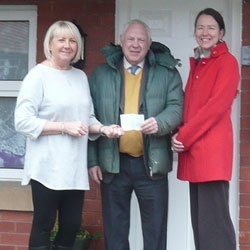 Stanley Grange - a homely and fulfilling community for adults with learning difficulties.When Horwich resident and member of Holy Trinity Jenny Dagnall found Stanley Grange for her son Andrew it was a prayer answered. That was in 2004 – twelve years on, 32 year old Andrew continues to enjoy life at Stanley Grange. 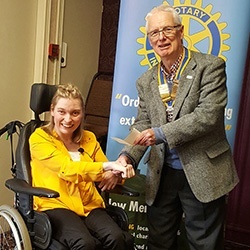 Members of Horwich Rotary very much appreciated Jenny Dagnall’s moving and informative talk about her experience of finding a safe, friendly, secure and supportive community for Andrew who has learning disabilities. Rtn. Bernard Cocker - "International Aid Trust". Horwich RMI, Chorley New Road, Horwich, Bolton. Contact Brian Gittins 01942819383 to book for meal or to apologise before 4pm on Wednesday.